Continually phoning and hanging up on someone who is looking for a lead singer to front their Rock band is probably not the best strategy to employ when you are trying to land the gig, but as odd as it may seem that was the tactic that Chloe F. Orwell used about fifteen years ago when drummer and songwriter Brad Elvis ran an ad in the Chicago Reader saying he was looking for a new singer for his band Big Hello. It proved to be a poignant moment in time for both Orwell and Elvis, as it would mark the beginning of a prolific musical duo that included the Big Hello and their current band The Handcuffs. “I was sort of young and quasi inexperienced. I was trying to get into a different kind of music. I had been in a couple of bands and it was great and fun, but I was looking for something different and I was getting into more of being a singer and songwriter. I was more playing than singing (at the time). They were certainly bands that I was able to cut my teeth on. I was just this young punky kid running around with guys in a band, just crazy and having fun. That is when I started getting a lot more serious about playing music. I felt that calling that one gets. I felt like I wanted to pursue something with more passion, more power and more integrity. I was looking to become more involved in singing. I had just written a bunch of songs and I did my own demo recordings, which turned out great for my first time producing and writing something myself and (I also) played a lot of the instruments. I went through a million different ads. I called a million different people in town and I went to a million different auditions. Nothing clicked, I didn’t like anything and they didn’t like me and then somehow I circled this ad in the Reader. In fact we still have the ad. I put stars all around it and I didn’t even know what he (Brad Elvis) meant by some of the stuff he put in the ad, but I just answered it. I actually hung up on him a couple of times, because I wanted to leave a voicemail message. I did not want to talk to him in person, and that is sort of funny, because I am such a loud mouth and not shy. I just said, ‘Hi I am answering your ad,’ and I didn’t hang up this time,” says Chloe F. Orwell. Orwell recalls, “The influences that he named (in the ad) were Cheap Trick, The White Album, (by The Beatles), Blur and Sparks. The White Album is my favorite Beatle’s album. The Beatles were a little before my time, but I have older siblings who were crazy about The Beatles, so I would play The White Album. I loved the record and it is still my favorite record. I love every song and I love the sequencing (of the songs) on that record. I love that a lot of the songs sound like a collection of singles that were just put on this record. I love the variety and the instrumentation. I thought it was so cool that one of his influences was The White Album. I had no idea who Sparks was and now I do of course, because it is one of Brad’s favorite bands and something that he was very influenced by early. If you are from Chicago or Illinois of course you know Cheap Trick, and Blur I was remotely familiar with. We had the most amazing conversation about music and The White Album for about an hour and one-half. I sent him my little demo tape of these songs that I wrote and produced and he loved it. He called me back and he said, ‘Why don’t you audition,’ and then I found out he was an Elvis Brother. Their band (The Elvis Brothers) was very loved and respected for the people of my generation and we all wanted to emulate them and their success. They had incredible showmanship and incredible musicianship,” says Chloe F. Orwell. Big Hello went through several incarnations, with the first version including Darren Cooper who now has the band Three Hour Tour, while the second look for the Big Hello had Gary Green from Gentle Giant, playing guitar. Eventually, Chloe F. Orwell appeared on the scene. In total Big Hello released three albums. “It just got to the point where we (Chloe and Brad) were pretty well doing all of the work and writing all of the songs and band members were coming and going towards the end. We just said, let’s start something where there is just Chloe and I and we will have a band and it won’t turn into this crazy everybody trying to write songs and all the democratic weirdness. We did that and it worked out great. We have a band (The Handcuffs) that we have had for quite a while now. We love them and we all get along great. Hopefully, it will keep running its course for a long time,” says Brad Elvis. Rounding out The Handcuffs is bassist Emily Togni, guitarist Ellis Clark and Alison Hinderliter on keyboards. Brad Elvis has also been the drummer for The Romantics (“Talking In Your Sleep”) for the past eight years. 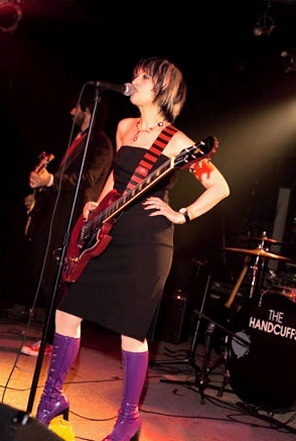 The Handcuffs have released three albums, the first being Model For A Revolution that unleashed the killer song “Can’t Get The Girl (Without The Good Stuff Baby),” and the song “Peggy Moffitt,” a tribute to the iconic 1960s model who was a favorite of fashion designer Rudi Gernreich and she was the wife of equally celebrated American photographer William Claxton. The album cover is essentially a photo of Peggy Moffitt and the song that bears her name, chronicles how she was “an inspiration, not an imitation,” and how she rose to fame. Moffitt and Claxton had become friends with Orwell and Elvis prior to Claxton’s passing. Musicians who appeared on Model For A Revolution, included, Graham Elvis (bass) of The Elvis Brothers, guitarist Frank Canino, of course Brad Elvis on drums and Chloe F. Orwell singing, playing the saxophone, keyboards and piano. The second album Electroluv with songs like “Baby Boombox,” the title song “Electroluv,” evidences Chloe F. Orwell and Brad Elvis’ fondness for Glam Rockers and throughout the three albums by The Handcuffs, the imagination, quirkiness and sound of artists such as David Bowie, Sparks, The Sweet and Suzi Quatro. That brings us to the current album for The Handcuffs, Waiting for the Robot. “There is a common thread (between the three albums) and Brad is the primary songwriter and I do write songs, but he is one hundred million times more prolific than me, which is great for me, because it takes a lot of pressure off of me. I love him and I really respect him. I am also championing Brad Elvis, because he is nearing his 4,000 professional career show (which he has since performed) and I feel he needs to receive more recognition. He is a very under the radar guy who is beloved and respected by big time drummers and musicians and I feel like he needs more recognition. He is also an incredible songwriter. He is an incredible drummer and an incredible songwriter. There is always a twist and a turn and a bit of an edge to our songs that may not even be evident with the first listen. They’re quirky. They are so accessible even though there are some twists and turns and some phonetic oddities. I do believe there has been an evolution (in our music). I think a lot of it was what we were listening to at the time; Bowie, T. Rex, Roxy Music, Ting Tings, Goldfrapp and even some (Bob) Dylan. I can’t say that we wanted to sound like any of these bands. They just served as inspiration and it was just good, good music to groove to,” says Orwell. Songs like “Dirty Glitter,” (Waiting for the Robot), with thundering guitar riffs, heavy drumbeats and dripping in Rock sensuality showcase Chloe F. Orwell’s outstanding vocals and her ability to energize the listener. If one strips away the instrumentals and listens to Orwell’s vocals on songs such as, “Miss You On Tuesday,” it is evident you are not just hearing another gritty Rock singer, screaming into the microphone, but possesses quality vocals and it is her ability to own the lyrics that combine with Brad Elvis’ musical genius that makes The Handcuffs’ sound so special. On the current album the tempo slows for “Baby I Love You,” when Brad Elvis and Chloe F. Orwell combine for a duet that basically is, as the title suggests. "For me “Dirty Glitter,” is like T. Rex meets Blondie. I try to channel Debbie Harry a little bit, who is one of my idols. For me that is what I feel that song is like. We wanted to start the record off with something we felt was really powerful and that (said) we mean business. “Dirty Glitter,” just the title is very Glam sounding. For us it was a really good introduction to what you can expect for the record. You also notice that there are some twists and turns that you don’t really expect. We wanted to ride out of the gate (with) powerful rock and roll songs or Glam Rock songs that will really engage people. Most people who do take a listen to it, they love that first song and it does make them want to listen to the rest of the record,” says Orwell. “Brad thought of the name The Handcuffs. We were just thinking of names and we were brainstorming. We weren’t living together at the time and he called me at my apartment and he said, hey I thought of this really cool name, The Handcuffs, because it is the two of us and we are kind of handcuffed together. We had also both been through a lot. He went through a really difficult, heart wrenching divorce and although we eventually got married, the divorce didn’t have anything to do with our relationship. We didn’t become a couple until long after he was divorced. I had cancer a couple of times and we went through that together. We felt like we were these two people who were handcuffed together through thick and thin. As Brad always says, it is a great Rock and Roll name,” says Chloe F. Orwell. 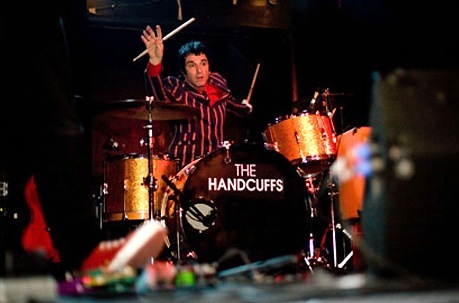 The Handcuffs is a good Rock and Roll name. They are also a really good band.